王玉玺, 董雅清, 余超, 张丹青, 王金荣, 张鑫, 朱永新. 敦煌地块南缘多坝沟花岗岩锆石U-Pb定年、地球化学特征及其地质意义[J]. 地质通报, 2019, 38(2-3): 242-253. Wang Y X, Dong Y Q, Yu C, Zhang D Q, Wang J R, Zhang X, Zhu Y X. Zircon U-Pb dating, geochemistry and geological significance of the Duobagou granite pluton on the southern margin of the Dunhuang landmass[J]. 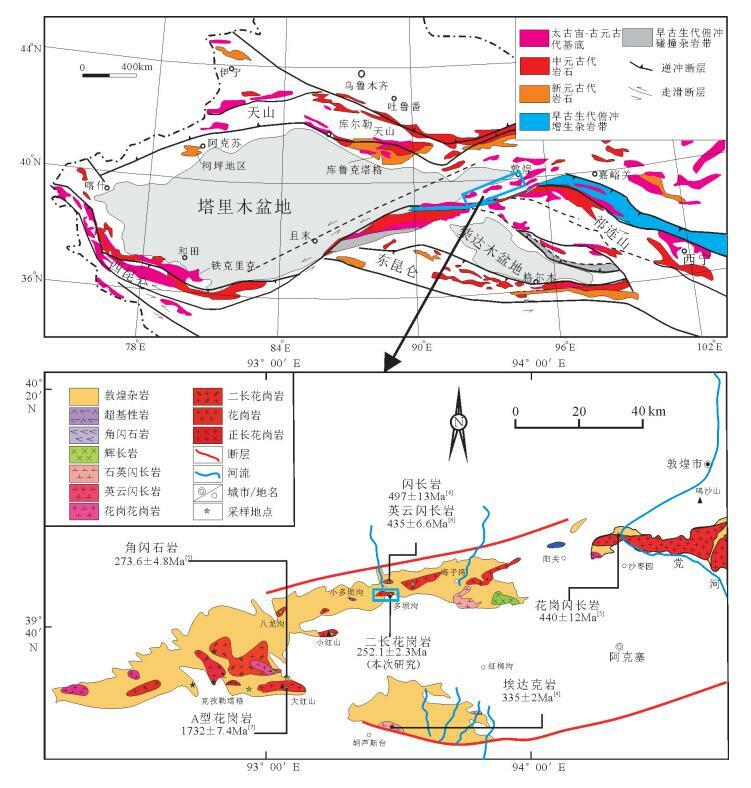 Geological Bulletin of China, 2019, 38(2-3): 242-253. Abstract: The Duobagou biotite monzonitic granitic pluton, distributed as a nearly EW-trending belt, intruded into Archean-Paleoproterozoic Dunhuang complexes in southern Dunhuang landmass. 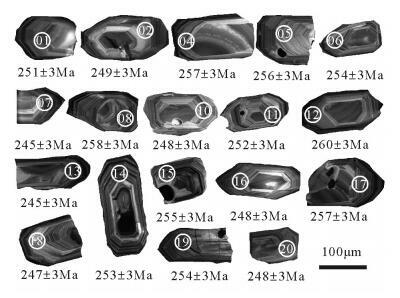 Zircon LA ICP-MS U-Pb data revealed the crystallization age of 252.1±2.3Ma, suggesting that Duobagou pluton was formed in Late Permian. Geochemical characteristics of monzonitic granite are similar to those of typical arc rocks. For example, the granites have high content of SiO2 (68.32%~72.82%) and total alkali (7.76%~8.00%), and their A/CNK ratios are 0.97 to 1.02, which are less than 1.1, indicating that Duobagou granites are high potassium calcium alkaline aluminium. They have obvious differentiation of REEs and weak Eu negative anomaly, and are characterized by strong enrichment of K, Rb, Ba and Cs and depletion of Nb, Ta, P, and Ti, with high ratios of Sr/Yb and (La/Yb)N. The sample PM04-1 shows high initial Sr isotopic ratio (0.707083), relatively low εNd(t) (-2.22) and Nd model ages (TDM2=1102Ma). The authors thus hold that the Duobagou biotite monzonitic granites may be the product of partial melting of island arc basalt in thickened low crust, and the Dunhuang landmass was likely to be involved into a series of orogenic events by the closing of the Palaeo-Asian Ocean at the end of Late Paleozoic, and possibly became the southernmost part of central Asian orogenic belt.